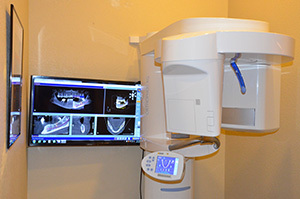 The Sirona XG-3D Imaging provides three-dimensional imaging to the dental community, right in the practice office. The system offers active sagittal, coronal, and axial viewing and manipulation. It enhances diagnosis and treatment planning by providing more accurate imaging. Using the 3-D mapping tool, dental professionals can easily format and select desired slices for immediate viewing. Cone Beam imaging delivers quicker and easier image acquisition a typical scan takes only 20 seconds. Offers advanced imaging within the practice. Safer – delivers less radiation to the patient. Thorough diagnostic information (optimum view of the critical anatomy of all oral and maxillofacial structures). More accurate treatment planning – confirm certain treatments are necessary. Reduces the length and cost of therapy. Delivers quicker and easier image acquisition – typical scan takes only 20 seconds. Scan images are ready for use in less than 3 minutes and can be emailed or placed on a CD-Rom for your use by the general dentist. The diagnostic images from the 3D scan can be easily converted into a third party software for pre-surgical evaluation and computer guided surgery. The doctor will receive a viewable animation to help him measure and analyze your case from every aspect. The data can also be used to fabricate your surgical guides.